Fedex asks us What will it be? 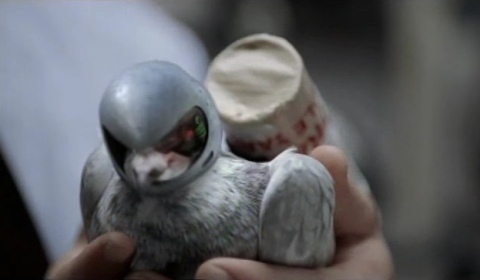 Carrier pigeons equipped with GPS and night vision? Giant pigeons who can carry (and drop) large objects? Or Fedex? An office worker in charge of dispatch assures his boss that the new scheme is working wonders. Carrier pigeons are given electronic instructions relating to their destination. The large packages, of course, are handled by huge pigeons. But what happens when packages and cars are dropped? A smashed window answers the question. 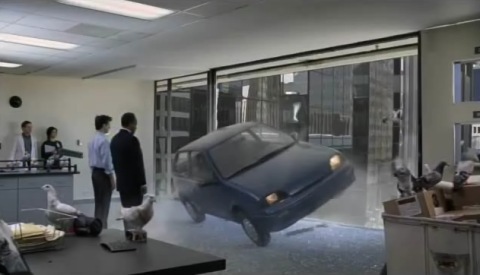 The Fedex Carrier Pigeon spot was developed at BBDO New York by executive creative director Eric Silver, associate creative directors Reuben Hower and Gerard Caputo, executive producer Elise Greiche, account director Erika Jackson. Filming was shot by Tom Kuntz via MJZ with director of photography Jeff Cronenweth. Editor was Gavin Cutler at Mackenzie Cutler. Audio post was done by Marc Healy and mixed by Tom Jucarone at Sound Lounge, New York. Visual effects were developed at Framestore, New York, by approximately twenty CGI artists and seven animators, supervised by Murray Butler and David Hulin. The giant pigeons were made in full computer generated imagery, creating the look and feel of 15-foot, half ton, genetically engineered birds. Quite a challenge, considering that each bird needed to have 30,000 feathers working just right. There were 250 real pigeons on set for the interior office scenes. Extra 2D birds were added to give the right feeling of activity. The office employee with the pigeon brainwave is played by Ian Untermann (Numbers). His boss is played by Sy Richardson (Pushing Daisies). Animal trainer was Mark Jackson. The American Humane Society was on site to ensure the pigeons were looked after well. See more on the scenes behind the scenes in video at Fedex.